5 days and counting, that’s what we have before Christmas day. I wonder if most kids even know why we celebrate Christmas? Jesus is The Gift and I hope more and more people come to know Him asap. If you are wondering how easy it is to get on with your journey, go to Romans 10:9. Yes, it’s that simple. Eternity in heaven. The alternative is going to be a real nightmare. I just got done dropping Mac off at the shuttle and boy were the deer ever moving this morning, should have had him walk to school so I could have gone on stand! My mind has definitely shifted from deer to fish, but all it would take is big buck to show himself and I could be distracted quite easily. The weather is going to change quite drastically starting tonight and I’m sure along with the deer movement, the fish are on the feed too. We are forecasted to receive 2-4 inches starting tonight and I’m hoping we are on the light end of that. We still need more ice to be made before the layers of insulating snow get dumped on top! I have been out twice with the SnoBear (www.snobearusa.com) and both times on Round Lake (part of the Gull Lake Chain here in central MN). We 8-10 inches of ice last weekend, but there are area lakes that have less. I’m hoping to head over to Mille Lacs on Friday and give the big lake a whirl. I haven’t talked at you since my trip to Lake Cascade in Idaho. 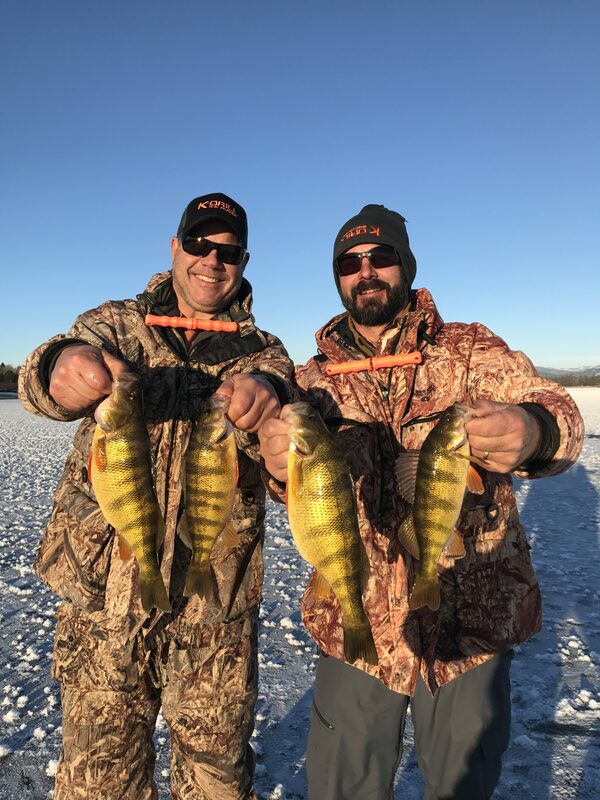 I went out to meet up with my brother and a couple of his buddies (Justin and Bryce) in search of perch, JUMBO perch! We caught some some giants and had a good time. Lake Cascade is home to the world record perch and I am thankful to have a brother who lives there and a friend with a cabin on the shores of the reservoir. You might want to add this to the bucket list! We had a JUMBO that was just shy of 15 inches. I am hoping to get back out there again later this winter. For now, I need to focus on the job at hand and get things dialed-in locally! If you are looking for that last minute gift for the ice fisher on your list, look up http://www.kdrillauger.com.